California has rightfully earned national and international acclaim for its leadership to reduce greenhouse gases (GHGs). We support California's program. However, we also recognize California's efforts fall far short of what's needed to avoid catastrophic global warming. Isn't the California Global Warming Solutions Act (AB 32) enough? AB 32 requires the California Air Resources Board (CARB) to develop regulations and market mechanisms to reduce California's GHGs to 1990 levels by 2020, representing a 25% reduction statewide. However, to avert catastrophic warming the world's scientists have concluded we must reduce GHGs to 80 - 90% below 1990 levels by 2050. Here's one way that could happen. 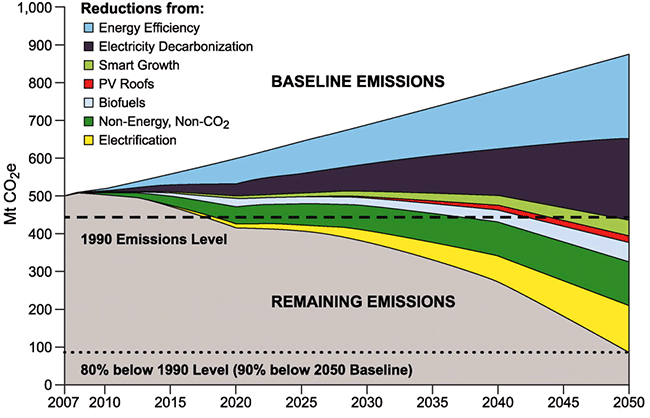 Doesn't California also have a 2050 GHG emission reduction goal? Sort of. When Governor Schwarzenegger signed AB 32 into law, he also signed Executive Order S-3-05 establishing another California target that would "by 2050, reduce GHG emissions to 80 percent below 1990 levels." However, there's no statute establishing specific requirements to achieve that goal or consequences if it's not achieved. It doesn't have the force of law. California has other GHG statutes, don't they flll the gaps? California's Sustainable Communities and Climate Protection Act of 2008 (SB 375) is intended to help California reach its AB 32 goals by promoting good planning with the goal of more sustainable communities. Specifically, it requires CARB to develop regional greenhouse gas emission reduction targets for passenger vehicles. CARB established 2020 and 2035 targets for each region covered by one of the State's 18 metropolitan planning organizations (MPOs). The Bay Area's MPO is the Metropolitan Transportation Commission (MTC) which covers all nine Bay Area counties (Alameda, Contra Costa, Marin, Napa, San Francisco, San Mateo, Santa Clara, Solano and Sonoma). MTC's targets are to reduce per capita GHG emissions from passenger vehicles to 7% below 2005 levels by 2020, and 15% below 2005 levels by 2035. However, the Association of Bay Area Governments projects a population increase of 26% from 2005 to 2035. Hopefully there will be enough tailpipe reductions to fill the gap. In any case, the statutory targets established by CARB fall far short of what's needed. California's global warming statute is under fierce attack from the major GHG emitting industries, especially petroleum. Shouldn't we focus our efforts on securing the laws we have? This is true, and yes we must. However, we must not let rightful and needed action to protect the power of existing law keep us from pushing forward to get the very deep carbon emissions cuts we actually need. We think it's vital to keep pushing to reduce greenhouse gases beyond California's requirements. Why are you working at the regional level instead of pushing California? There is already a coalition of well-funded environmental groups in Sacramento (Environment California) working closely with the legislature and the governor to both maintain the laws we have and push for stronger ones. We support Environment California and its member organizations, but we're not best positioned to add significant value to that effort. There is reason and opportunity to take action in the Bay Area. See Bay Area FAQs.